It’s always a good idea to keep 4-6 bottles of water in your car. Should you get stuck, you will need to stay hydrated, even more than you will need food. Try to keep the water in the car rather than the trunk, as it is less likely to freeze. If it does freeze, put it on the floor near the heating vent or use hand warmers to thaw (see #9). If you do plan on keeping an emergency stash in your trunk, just make sure you drink it by the end of winter. The plastic from the bottle can leach into the water if it gets hot or sits in the sun during warmer months. I rarely leave the house without a snack stash in my purse. This time of year, I carry a few extra just in case. It’s also a good idea to pack a ziploc bag of protein bars along with snack-sized bags of pretzels, crackers, and nuts to leave in the car. Again, remember to rotate them out before they expire. If you are stranded without heat, it can get really cold really fast. Keep an old blanket or two in your trunk to keep you warm. In addition to a blanket, I keep a few old hats and gloves along with a few extra shirts in my emergency stash. God forbid your car ends up in a ditch during a storm. If the electrical system fails, you will need another way to signal for help. I keep a forever flashlight in my glove box. I never have to worry about batteries, just shake for 30 seconds and I get up to 5 minutes of light that can be seen from a mile away. If you don’t have a forever flashlight, a regular one will do. Just remember to check the batteries often. Starting at around $20, a basic car repair kit should contain jumper cables, fix a flat, and flares. More expensive kits can contain these items as well as a few others on this list. Also be sure to check your spare tire to make sure it is in good condition. Keep a mini kit with basics like band-aids, antiseptic wipes, antibiotic ointment, and gauze to handle minor first aid situations. I know this seems like a given, but double check to make sure you have both or a combo that has the ice scraper on one end and snow brush on the other. It’s also a good idea to keep a trunk shovel on hand in case you get stuck and need to dig snow from around your tires. The last thing you want to do is run out of gas while you are stuck in the freezing cold. It’s always a good idea to make sure you keep your gas tank no less than half full at all times in case you have to run your car to stay warm. Chemical hand warmers like HotHands will keep you warm for up to 10 hours. Just open and shake. They are very compact and only cost about a $1 a pair at most local drugstores. Put them in your gloves, in your shoes, or anyplace that you want to keep warm. Always plug your phone in when you get in the car, even if it’s charged. It’s the best way to get help fast if something goes wrong. Also keep a power bank in your car or in your purse as a back up to charge your phone in an emergency. I store most of these items in my glove box and in an oversized recyclable shopping bag in a corner of my trunk. Thankfully, I have not had to use many of them, but I feel better knowing that I am prepared. Did I miss anything? 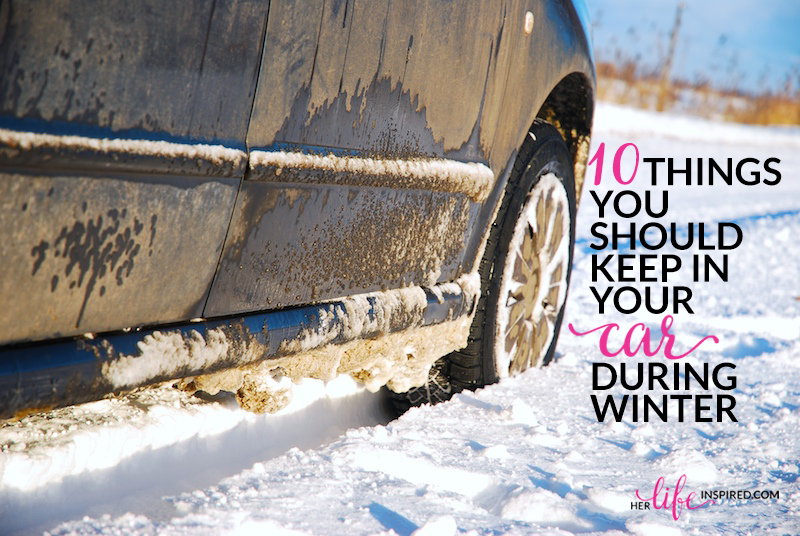 What other items should you keep in your car during winter? I Admit It…I’m A Basket Case! I’m really terrible at emergency preparedness… I have to step up my game. These is such a great list, and I realize now how much I really should be keeping in my car. At the very least I should have a blanket and some water! I think I need to remedy this situation ASAP. I learned about keeping a blanket in the car the hard way. A car can get really cold very fast. For those with kids, it doesn’t hurt to keep pull-ups handy as well. While you’re staying hydrated until you’re able to get back your way, nature will definitely call and kids can’t exactly hold out for a bathroom for long periods of time. Great list. Definitely need to restock our car snacks and waters. That’s a good one! Probably a good idea to keep an extra outfit in the car as well. You never know!